Last Monday I was headed toward the airport in San Diego. I didn’t want to leave. It’s beautiful there and I can see why people flock to live there. That said, I was really, REALLY glad to get home. RWA Nationals is always an adventure. I get to see so many old friends. I get to spend a week with people who eat, drink, sleep, and breathe writing romance and romance books. It is invigorating, and thrilling, and exhausting. And when I get home, I’m…torn. Part of me is fired up! I want to writewritewriteWRITE!!!!!!!!!!!! And part of me feels just a little bit like an imposter. Especially this trip. I had “social obligations.” Which is a southern way of saying “OMGWTFBBQ! People like me! They really LIKE me!” I had luncheons and meets for drinks (more coffee than booze), I had cocktails and appetizers, I had receptions. I stood in Nora Roberts’ suite, after introducing myself to her, and stared at all the movers and shakers in my industry and wondered WTF I was doing there!??! Yeah, a lot of it had to do with the RWA National Service Award I’d won but a lot of these people knew me by sight, and many of the others knew my name. It was…odd. For someone who really likes to sit in a corner and observe in instances like the above, I was thrust somewhat into the limelight and most definitely beyond my comfort zone. Still, I wouldn’t have missed it for the world! I sat next to Roxanne St. Claire at a luncheon, and contrary to on-line threats, she did NOT kiss me on the mouth. 😉 I had coffee with Jennifer Lyon and we talked and talked like old friends do after any sort of separation. I learned that the president elect of RWA has family in my hometown and we commiserated over wine and amazing appetizers. I saw my editor often and shared meals, snacks, conversation, a long walk (along with Cindy Dees who tagged along with us between hotels–and major fan girl moment for me! ), and watching the RITA awards with him. I gave away all my print books (Devil’s Cut, Night Shift, and Double Cross) at the Indie signing, along with quite a few of the cards with free downloads for MOONSTRUCK: SECRETS. I met new authors and hope I gave them encouragement in the answers I gave to their questions. I stayed up late, got up early, and never really spent the time I wanted on my balcony just watching the ships go by. But that’s okay too. This entry was posted in Writing Life and tagged fun stuff, fun travel and adventure, herding cats, Monday, musing, RWA16, writing. Bookmark the permalink. Sending lots of positive vibes! I’m so sad I wasn’t there this year. First time I’ve missed RWA since 2010. I’m trying to figure out a way to make it to Orlando next year. I need time with my romance writer friends!!! And we need time with you! 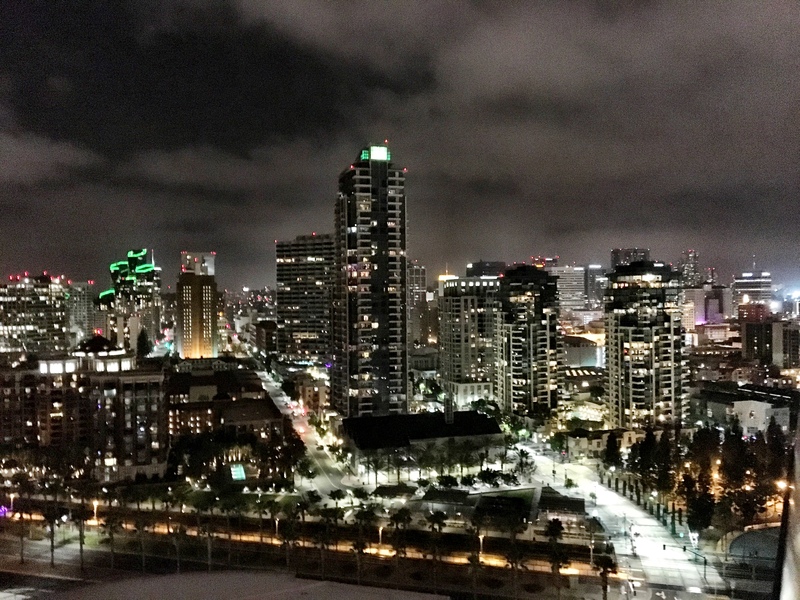 San Diego was gorgeous! I really hope to see you in Orlando.